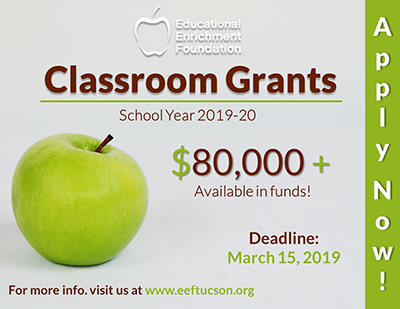 Don't miss is your opportunity to submit your proposal for that great idea you've had for your classroom or that project you've been lacking the funding for!EEF Classroom Grant Applications are being accepted now through March 15, 2019. We've made the process to apply for funding easier than ever! All submissions are online this year, so no rushing to EEF at the last minute or making copies to turn in! It's so easy! Simply go to the EEF website http://www.eeftucson.org/Classroom-Grants and follow the steps outlined. Don't miss your chance to get funding for your "big idea".